The Working With Others Group is active in carrying the message outside meetings to the community and into hospitals and institutions. We organise rosters of AA members to visit a local Drug and Alcohol Detox Centre and a local Women’s Rehab. We supply a AA member to speak each month on Radio 3CR Living Free show. Here’s the audio from past visits. 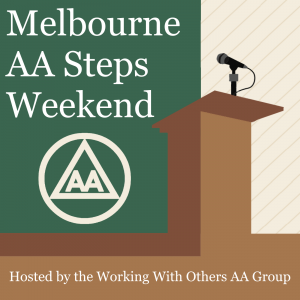 Our group also hosts the annual Melbourne AA Steps Weekend in May each year. If you are interested in joining our group and participating in service work, please come along to one of our 4 Weekly Group Conscience Meetings.